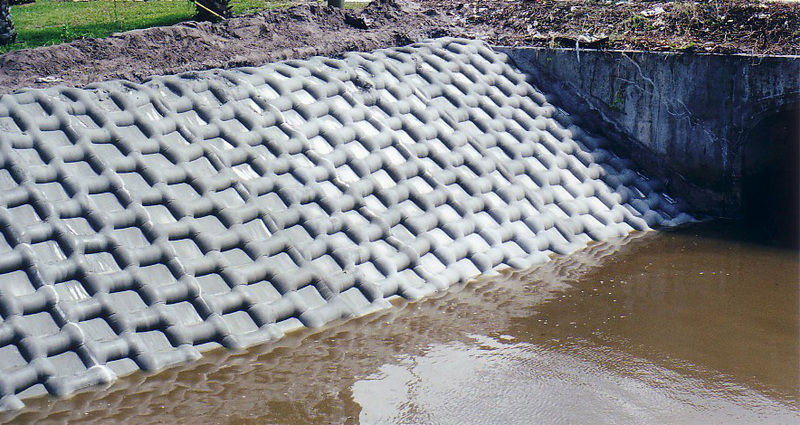 GeoTextile Concrete Linings offer environmentally superior protection from occasional high water flows. Installation is minimal and requires little manpower. Plants can be added on concrete lining for an evironmentally pleasing effect. Our Concrete Linings can be intalled in drainage ditches and on the banks of channels, rivers or canals, reservoirs and other structures where Hurricane Storm Protection runoff can be an issue. Concrete Linings are made up of concrete filled GeoTextile fabric sections and with patterned voids where vegetation can be grown. After filling with the concrete, voids can be cut open to filled with topsoil and either seeded or planted. This effectively creates an attractive erosion control system that can withstand severe weather and environments as well.